The Fund4WrightState competition raised money for tuition assistance while teaching students about the importance of giving back to the university. The importance of giving back to Wright State University was not lost on cash-strapped students who filled up piggy banks during April Craze as part of a competition to help fund scholarships. Colorful porcelain piggy banks lined the Student Philanthropy Council’s (SPC) table at April Craze, a celebration that marks the end of the semester. 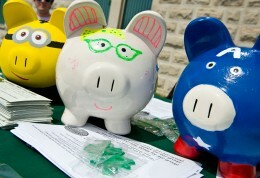 The piggy banks were part of the council’s Fund4WrightState competition aimed at raising money toward tuition for four Wright State students. The Student Alumni Association won the competition, with more than $70 filling its piggy bank. Becky Valekis, assistant director of Annual Giving, said tuition only covers about 59 percent of what it costs for a student to attend Wright State so private support is needed to bridge that gap. Holly Gersbacher, assistant director of alumni relations for the Student Alumni Association, said the Fund4WrightState competition was a great way to support the Wright State community. The Wright State Alumni Association represents more than 100,000 alumni living in every state in the United States and in 40 other countries. From Legacy Scholarships to networking opportunities, the association strives to provide its members with a wide variety of benefits in athletics, arts, entertainment and education. Since 1994, the Legacy Scholarship program has provided tuition assistance to students pursuing their Wright State degrees. These scholarships are intended for the families of Alumni Association members and continue to grow the university’s institutional heritage. The Student Alumni Association demonstrated their dedication to helping students with their victory in the SPC piggy bank competition. “The Student Alumni Association works to facilitate a relationship between students, alumni and the community and works collaboratively with other student organizations to instill a sense of tradition amongst students,” said Gersbacher.